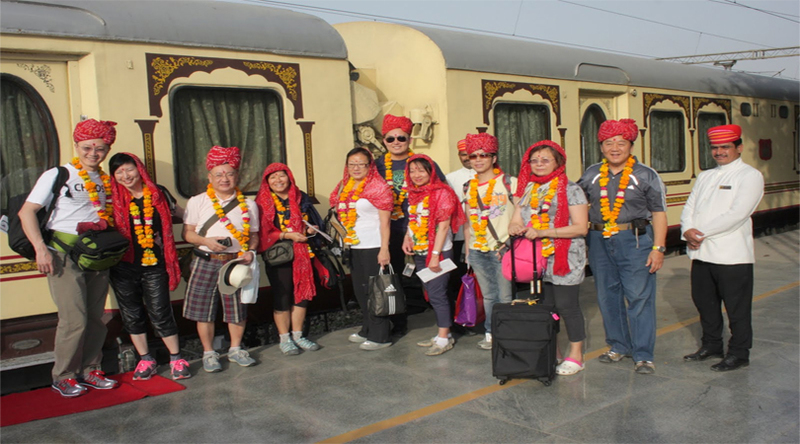 The Royal Rajasthan on Wheels is a luxurious train that is run by the Indian Railways for tourism. It is a model of the palace on wheels. This train takes you through various places in Rajasthan including heritage sites, wildlife attractions and other tourist destinations. The Royal Rajasthan on Wheels is a luxurious train. It has super deluxe saloons, Wi-Fi, satellite TV, music system, exclusive and exotic dinning cars and a coach for souvenir hunting. There is also a new royal spa inside the train. The trip goes for seven days and one extra night. It starts in New Delhi Safdarjung station and goes through Jodhpur (on the next day), Udaipur, Jaipur, Varanasi, Agra and ends in Delhi again. Other destinations covered are Chittaurgarh, Ranthambore National park, Khajuraho, Sarnath and many others. The top spots to enjoy in this route are the Hawa Mahal, Moti Mahal, Sheesh Mahal, Lake Palace, Fort of Chittaurgarh, Fort of Agra, Taj Mahal, Keoladeo Ghana National Park and many others. Sometimes the destinations change based on the type of tour packages that you choose. There are a lot of packages like the religious tour, which last up to 11 days, desert tour for 8 days, exotic Rajasthan tour for 9 days and many others. It is not just a train tour that takes you to several places on a luxury train. This is a style of journey that kings and top class people took in the bygone era. Each destination would receive you with red carpet and welcome tune of royals. You can enjoy rides on camels and elephants too. If you are planning to visit the desert, you can enjoy a luxurious and romantic desert dinner in sand dunes with moon light and star glitters. You can also dine in certain royal palaces like kings and queens. This Royal Rajasthan on Wheels package is for those who want to sit back and relax with their cocktails while the train takes you to exotic places and make you enjoy all top activities that you ought to experience in the royal sands of Rajasthan. This service is available all throughout the year. But, when will Rajasthan is on its prime beauty? The summer would be scorching and thus, it is not suited for those who want to enjoy the desert safari and other attractions. The rainy season would be pleased, but you would not be able to see a lot of tourists as the rain would hinder sightseeing and other activities. November to February is the winter season in this state and this is the time when you can enjoy a wonderful and royal styled vacation in Rajasthan. The temperature can go as low as 10 degree C here. If you are looking for spending summer time in Rajasthan, the early summer would be a better option or, you can nest in the cool surroundings of Mount Abu. If you are planning to visit Royal Rajasthan on Wheels in monsoon season (July to September), you ought to watch a few peacock dance. Udaipur would be at its prime beauty during monsoon season and make sure you do not miss it. If you are looking for some romantic time in Royal Rajasthan on Wheels, monsoon is the right time. Winter is the right season for all kinds of vacationers. What type of vacation are you planning to enjoy in Rajasthan? Pre-book the tickets in Royal Rajasthan on Wheels to avoid the crowd.